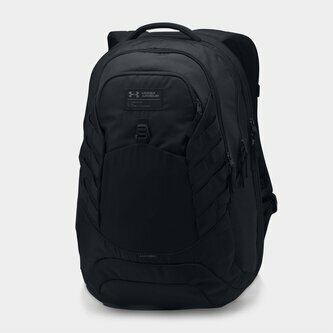 Carrying around all the items you need for your hectic social life can be hard but make sure you look the part whilst doing it with this Under Armour Hudson Training Backpack in Black, Black and Black. This backpack has all the pockets you need for all your many items and can even organise them just how you like it to keep things running as smoothly as possible. With a pocket for your laptop, phone, water bottle and so much more UA really have thought of it all. The easy accessible TSA-friendly laptop sleeve unzips to lay flat so you don't need to remove it from your bag whilst the front panel features a second tricot-lined valuables pocket for that added space. The UA storm technology used to craft the outside of this bag is vital as it delivers a highly-water resistant finish to tackle any element whilst the tough abrasion-resistant bottom panel has been crafted for extended durability. The large main compartment allows for tons of storage with the second zip compartment offering storage for phones and charging cables as well as keeping items organised. With two side pockets ideal for storing water bottles and smaller items, this bag also uses compression moulded shoulder straps and Charged Cushioning on the back panel for total comfort.